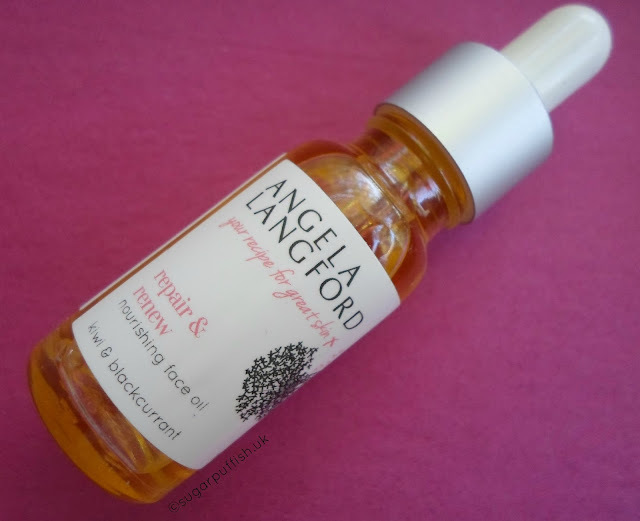 Angela Langford Skincare has come a long way since I first discovered them in 2011, long before Angela appeared on Masterchef. Her passion for ingredients goes beyond food and is evident in her skincare. At the end of last year I attended an event where I finally met Angela and she kindly gave me her *Repair & Renew Face Oil. I would suggest Repair & Renew is most suited to mature skins prone to dryness (which FYI is my skin type). I was drawn to this face oil because the blend of ingredients stood out to me. I have a personal interest in rosehip, kiwi seed, evening primrose, macadamia, rice bran and arctic blackcurrant. These are ingredients which may help reduce the signs of ageing, tackle concerns for fine lines/wrinkles, dryness and rejuvenation of skin. Repair & Renew a rich oil with noticeable heaviness compared to others I have in my collection. As my skin is eczema prone it is permanently parched of moisture so I don't notice greasiness from this oil. Sadly, I had to stop using because my skin had a hissy fit probably due to the essential oil allergens. It's becoming a real problem for me and I'm gutted to not continue with this product. I can use in small doses but not on a daily basis. Angela provides a sample service which I think is a great idea. By providing information at registration you'll be sent products personally selected for your skin type. I think this makes Angela Langford Skincare stand out from others and it was how I originally discovered the range. I've also had the pleasure of sampling through judging on the Free From Skincare Awards. If you like to support British natural skincare brands, then you definitely need to take a look at Angela Langford Skincare. it is a shame but part of the course of having sensitive/allergic skin. sorry to hear about rosehip, that's one of my big loves.